Varchild here is another example of a card that us old-timers never really expected to see. She was a big part of the storyline for Alliances, and when she didn’t appear in Coldsnap, I for one thought she wasn’t going to be declared relevant to modern Magic. I was wrong, and that’s pretty cool. Not only is she an interesting political tool in multiplayer games, she is actually really strong in constructed, too. The Survivors will just have to sit there because their controller only has one opponent, and if they deal with Varchild, you get a bunch of tokens in return! Just watch out for Opposition or Glare of Subdual . . .
Another blast from Magic‘s past, Varchild finally makes her debut on a card, and it is…interesting. Very interesting. She definitely keeps with her brutal reputation: burninate all the things, and leave behind cowering masses. Or, at least, that is the plan. Her effect is an interesting one: she leaves behind Survivors for your opponents when she gets through on a hit. She has no evasion and is just a 3/3 on her own, so you might need some help to get through past the first turn she’s out. At least the Survivors can’t block her onslaught, right? She’s fun in multiplayer for encouraging everyone to go for each other (and not you), as her mere presence scares the populace into submission. The other effect is a bit meaner: when she leaves, the Survivors flock to you. If you’ve gotten some licks in, her departure will leave you with a veritable army, and that is rather nice. This thus makes for a bit of tension: she wants to play with go-wide strategies, but Boros and white are the major loci of those enablers. So she’d rather not be the Commander for a deck, but those decks she’d go into would oft have trouble digging her out. 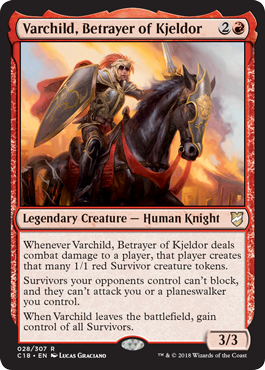 I do not see Varchild, Betrayer of Kjeldor making any ripples in Legacy, but she is a nifty red legend you can have fun with in Commander and at your kitchen table.